This cottage has a wonderful location, it is located 3 km from central Åhus. The terrace is under roof and charge her garden furniture to relax. Sea is a large wooden deck with a barbecue. This comfortable holiday home is on a wonderful plot in Ivö near Lake Invösjön, where you can also fish and swim. The house has a beautiful wooden terrace to the west and a beautiful garden. The property is hidden from view. 150 m are to the sea and beach. This cozy cottage has a wonderful plot at the edge of the forest next to a horse farm. Nearby is the shopping and eating Kristianstad. The horses graze on the property line. 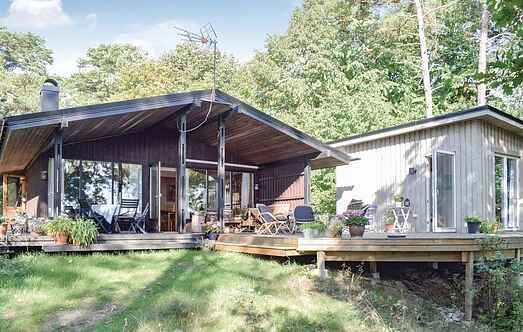 The holiday home with an annex on a nature plot 200 meters from the sea and the sandy beach is between Kivik and Åhus. The holiday home is well positioned close to the sea and sandy beach and within easy reach of Åhus and Österlen. This cosy holiday home is situated just 350 metres from Yngsjö beach, where white sandy shores overlook the glistening Hanö Bay. Where the forest meets high up on the plain, this beautiful apartment awaits you. Here you can enjoy beautiful nature and views of the beech forest. There is a lot of game in the woods. The cottage has a good standard and is located near Kristianstad. The garden has a terrace, provided with garden furniture. For children there is a sandbox. This gorgeous holiday home is just 300 metres from a beautiful, endlessly long sandy beach. In Åhus, this holiday house with terrace, close to the sandy beach. Here you can walk in the harbor and to settle in one of the many gardens of the seat restaurants. This beautiful home with a cosy garden is located at the centre of Aarhus. The home is located near galleries, boutiques and a bustling beach life. Nice holiday home on a wonderful plot with terrace, located 300 meters from the lake for swimming and fishing. This beautiful holiday home is on a horse farm. This home is next to a plot with grazing horses. Lake Immeln is located nearby, where you can rent canoes.